January 19 was the 2nd Central Park Ice Festival. 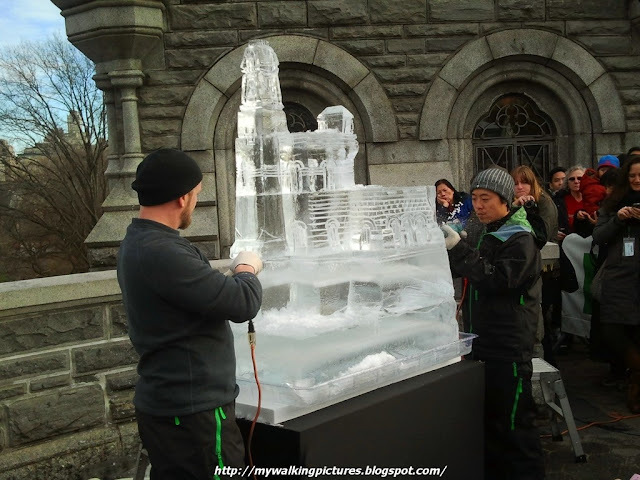 Held at Belvedere Castle, Okamoto Studio carved a scale replica, in ice, of the beloved landmark before the eyes of about 4,500 spectators. 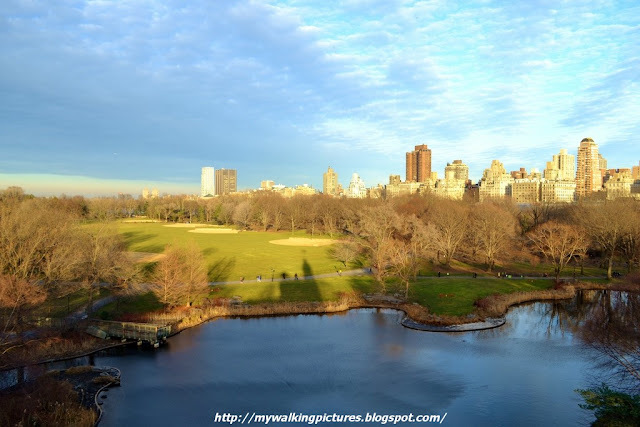 Central Park might be the last place you would expect to see a castle but that is exactly what you will find at 79th Street. 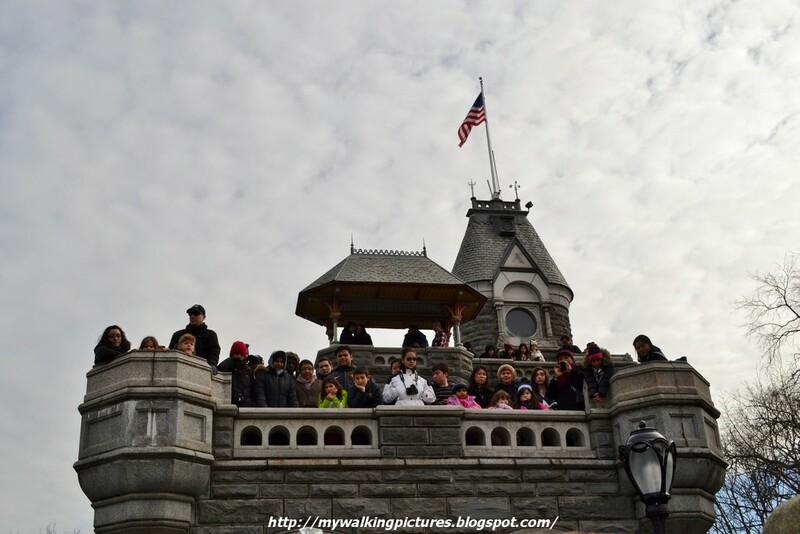 Belvedere Castle sits high above the city on Vista Rock, the second highest natural point in Central Park. Belvedere means 'beautiful view' or 'panoramic view' in Italian and the castle provides impressive views across Central Park and New York City. Here's the finished product in ice, in front of the real Belvedere Castle. As usual, I entered the Park through the southeast portion. 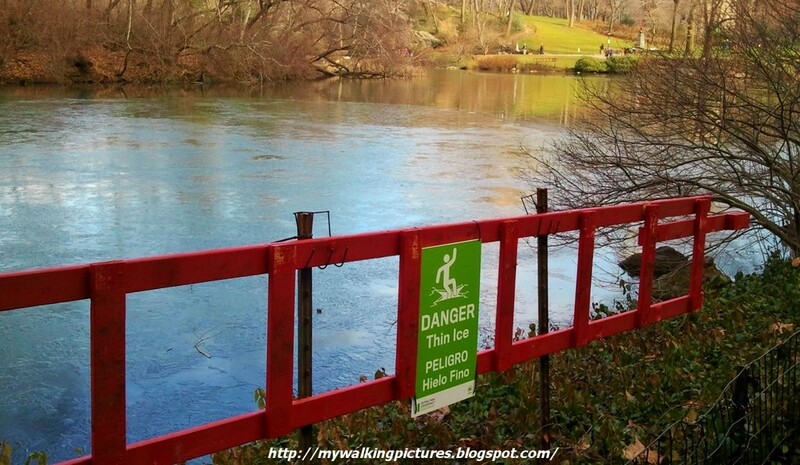 Signs were everywhere warning people about the ice in The Pond. 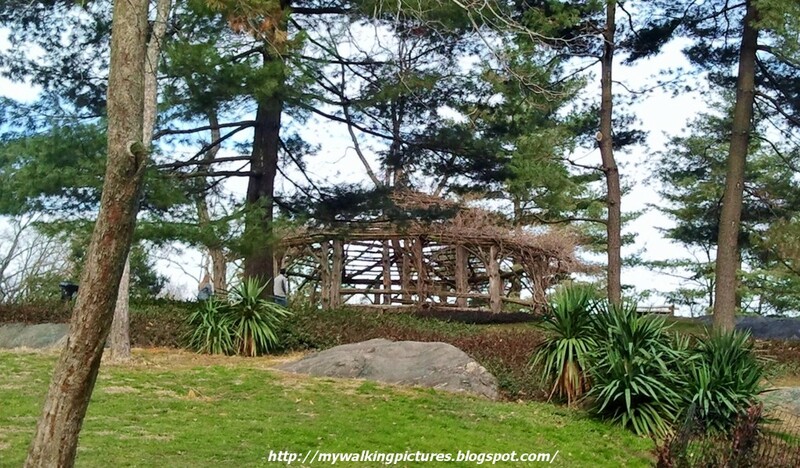 Walking towards the west side, I passed by one of the Park's wooden rustic structures, Cop Cot, along 6th Avenue and Central Park South. Sometimes the Imagine mosaic at Strawberry Fields is full of flowers and little offerings. That day there was only a single white rose although the area was full of people and music when I passed by. 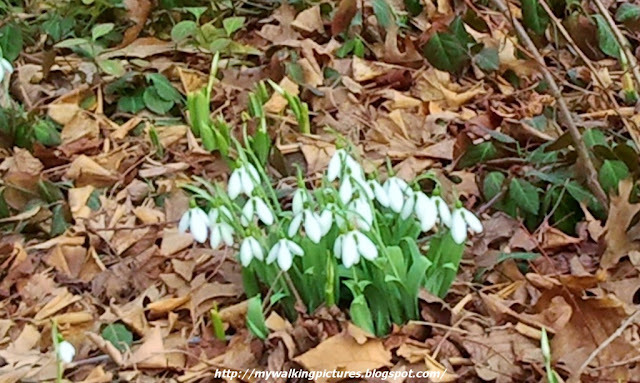 And there were a lot of snowdrops blooming around the area. Is Mother Nature in a hurry? Passed some rustic benches on my way to the Castle. 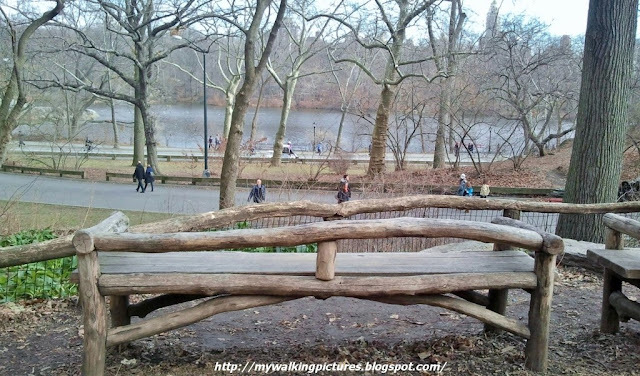 Facing The Lake, these benches sure have the best views. Maybe when the weather gets a little warmer, I'll sit here and enjoy the view while watching people pass by. I also passed by the Park's only double arch, Eaglevale. 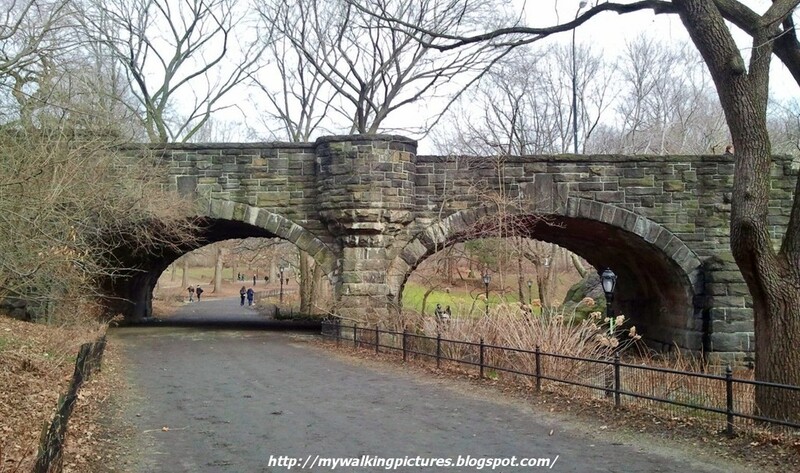 Two summers ago, I walked around the Park to take pictures of all the bridges and arches. One of these days, I'll upload my pics and write about them. Turning right from the arches leads you to another bridge, Balcony Bridge, which is near Shakespeare Garden. At the garden, I came across these flowers in bloom, I think these are hellebores. 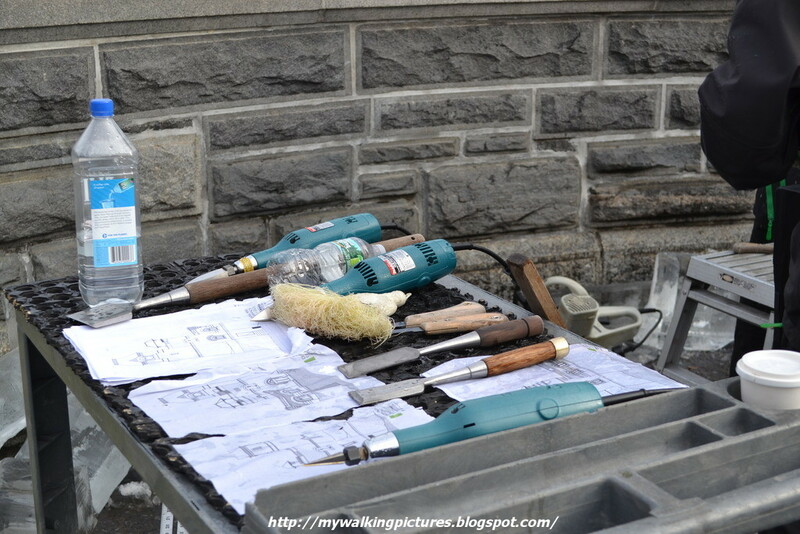 Then just a few steps away, I'm at Belvedere Castle where carvers from the Okamoto Studio were busy carving a replica of the castle. It started with blocks of ice placed on top of each other. Then the ice carvers measured, sawed and chiseled away at the ice. At one time, Okamoto was interviewed, right in front of me! 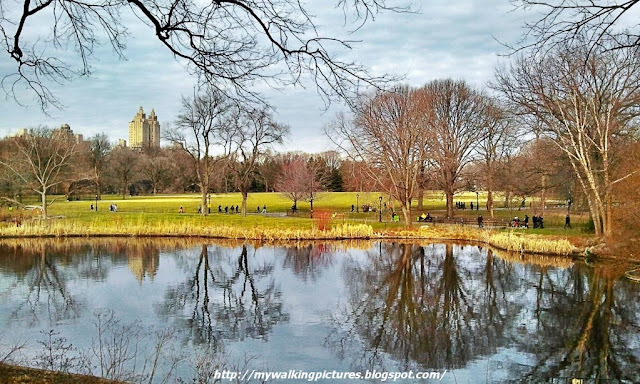 While the carvers were busy, there was free hot chocolate for everyone, and members of the Central Park Conservancy gave talks about the Park's history. 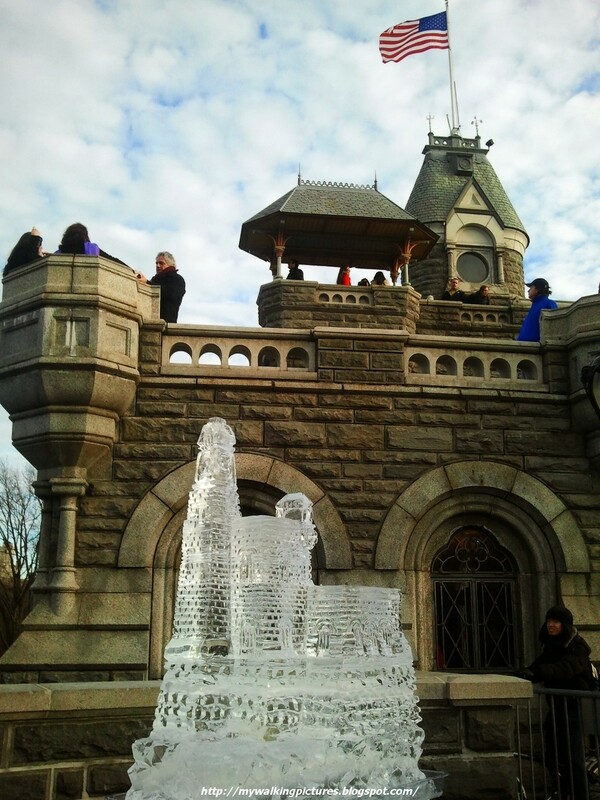 Even the balconies of Belvedere Castle were teeming with people watching the ice carving. On a table are copies of the design and measurement, as well as the tools the carvers were using. You can see the two of them looking at and checking on the design from time to time. I knew the ice carving will take a little bit longer so I decided to walk up to the Reservoir area and just come back to see the finished product. On the way I passed by Turtle Pond, it is right beside the Castle, stretching to the back part of the castle, at the east side of the park. 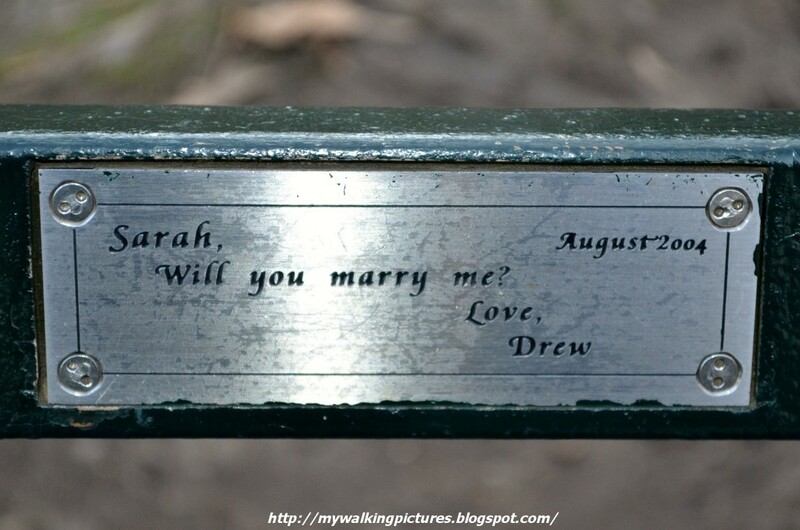 I also passed by another marriage proposal on a bench plaque. I love these, I wrote about the plaques in one of my early blog posts. Another one to add to my collection of bench plaque pics. 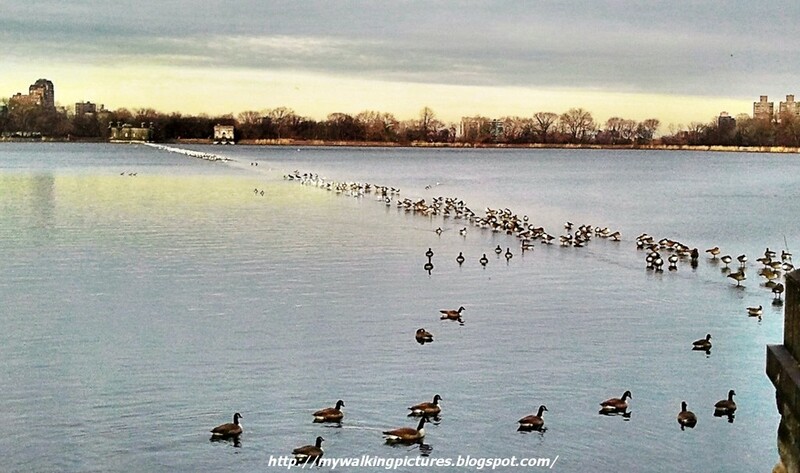 Upon reaching The Reservoir, I saw that there was a waterfowl convention again. Most often when I walk around here, there are always a lot of birds and sometimes they stretch from end to end, like today. The white ones at the north end are seagulls, I think, while most of the waterfowl nearest me are Canadian geese. 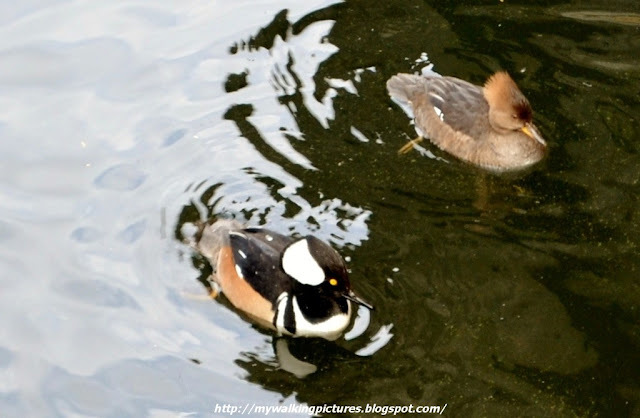 It's always a delight to see new birds, these are hooded mergansers, you can see them in the Park during winter only. 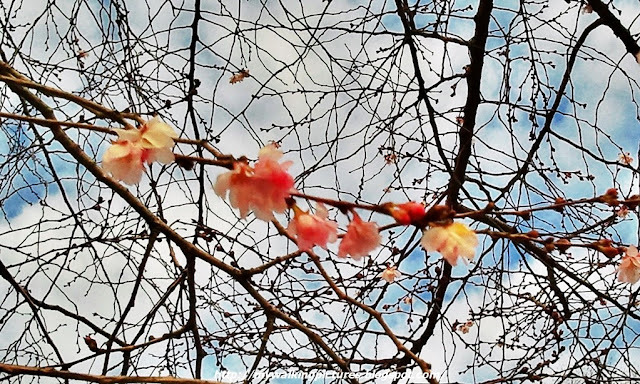 On my way back to Belvedere Castle, I passed this cherry tree, blooming in the middle of winter! 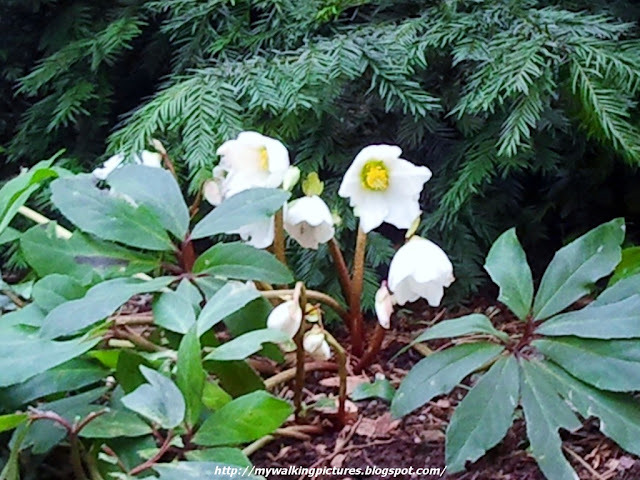 Love seeing the blooms but it is too early for them to come out, and the week after that walk there was a cold snap. I hope to see this tree overladen with blooms in the Spring. 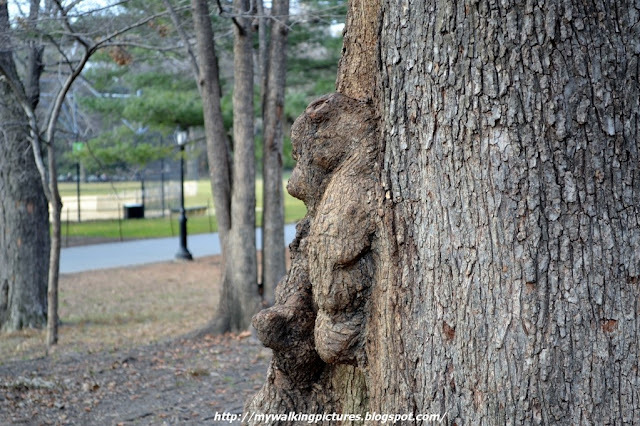 I also passed by this tree, and I think I spotted a teddy bear! 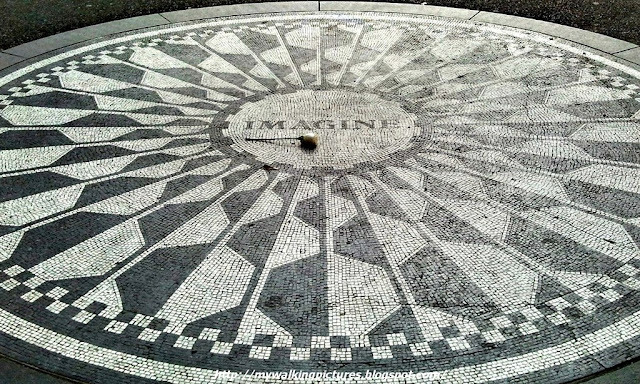 Did you see one, too, or did you see something else? 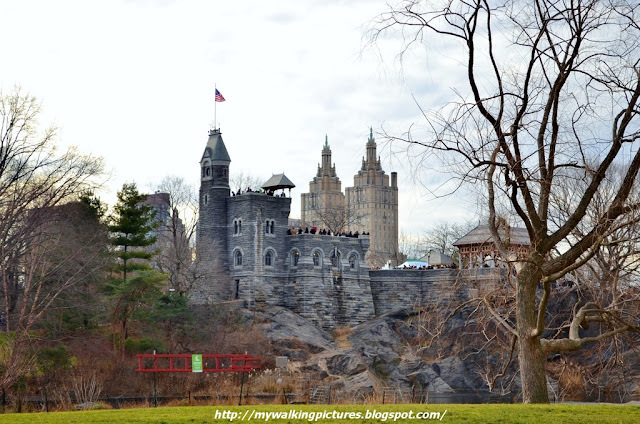 From the Great Lawn, I had this view of Belvedere Castle, with the twin towers of The San Remo looming at the back. 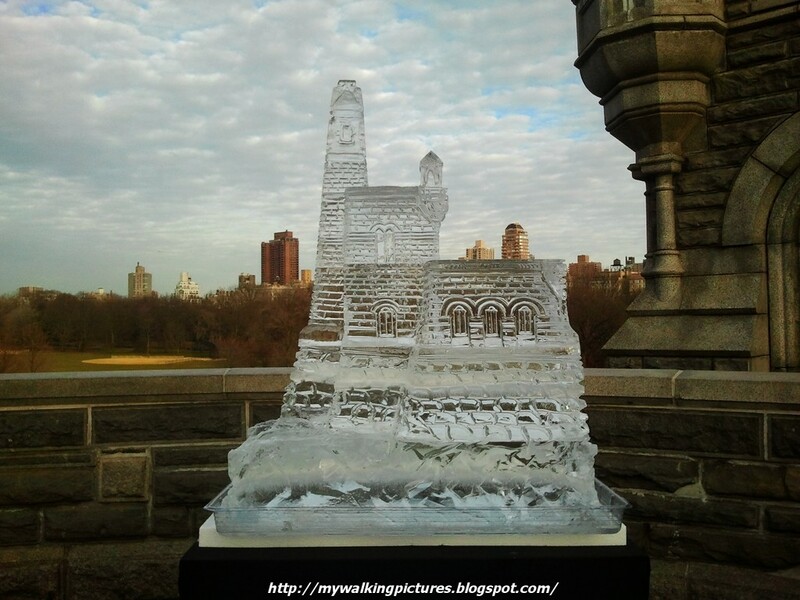 When I arrived back at the castle, the ice carving was finished, it looked so pretty! 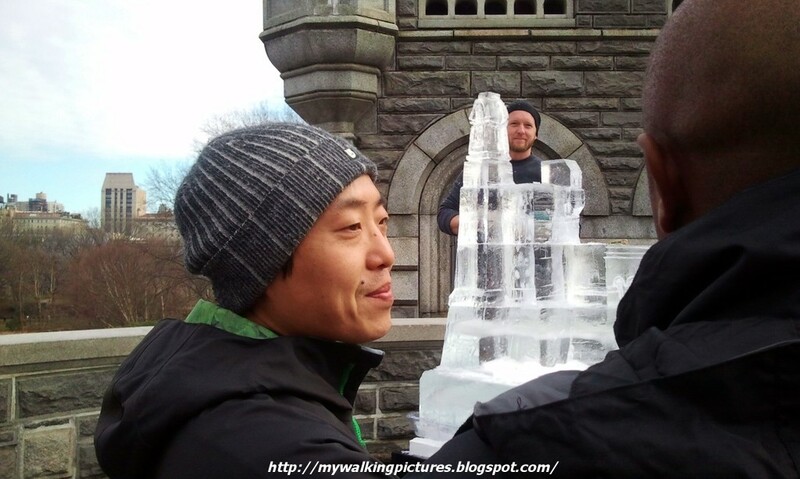 By this time, most of the people who watched the ice carving were gone. As the observation deck wasn't too crowded anymore, I went inside the castle to enjoy the views of the park from the balconies. What a great view! 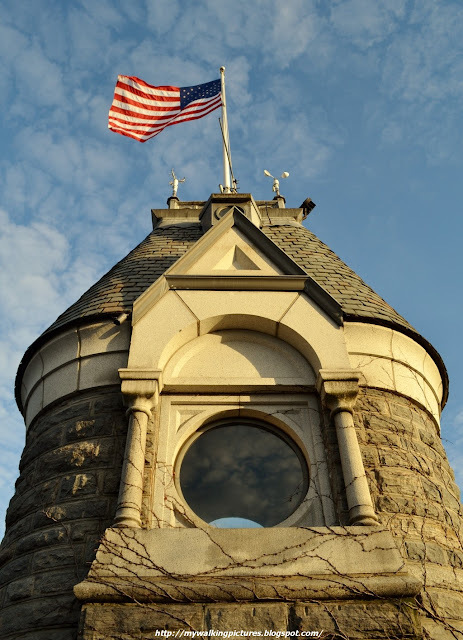 You can also see some of the scientific instruments used in recording the temperature in Central Park from atop one of the castle's turrets. 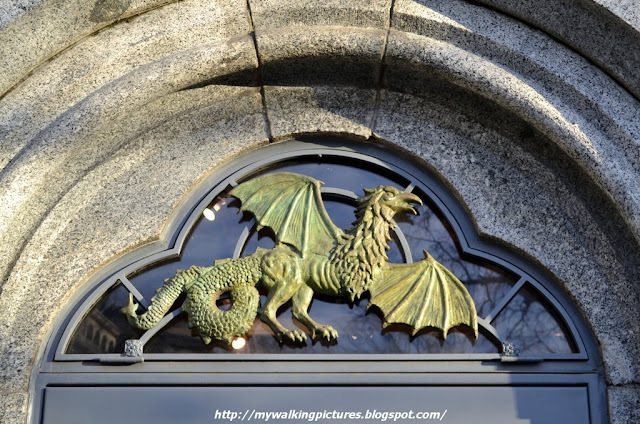 Above the exit door at Belvedere Castle is a dragon. 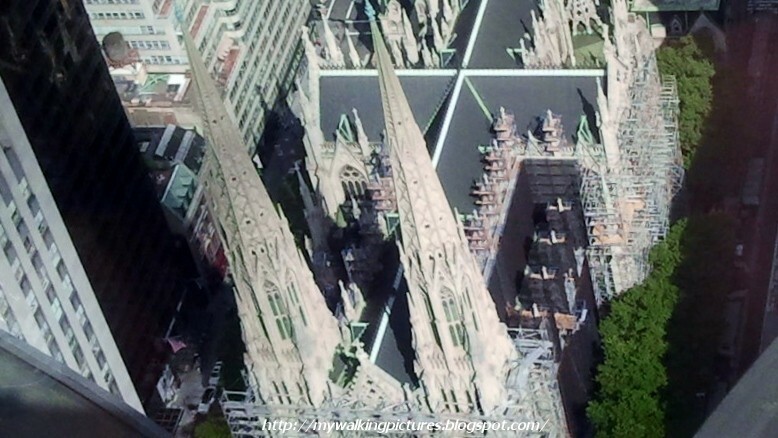 It has an eagle's face, a serpent's tail, and the wings of a giant bat. Hmm, where else would a dragon be but in a castle? 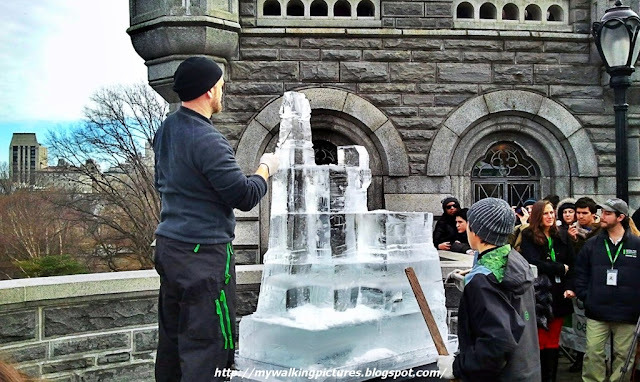 I remember last year during the First Ice Festival, which was held at the Tavern on the Green area, the carvers carved two beloved park figures. One was Belvedere, one of the Park mascots, and the other one, the Angel of the Waters. I wonder what they will carve in the next Ice Festival. I'm sure it will be something people will love to look at and enjoy. Thank you Central Park for another great winter activity! 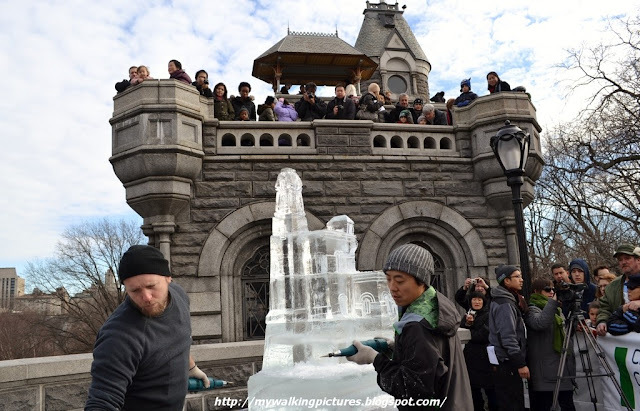 My pics for the Central Park Ice Festival are included in my Flickr album Central Park - January 2013. 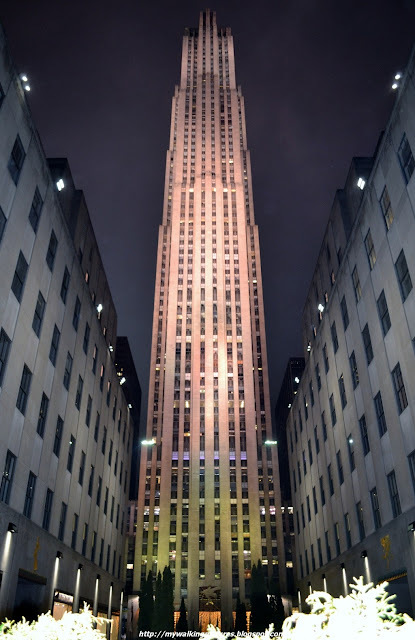 Last summer I submitted some pics I took of the Channel Gardens to the Facebook page of Rockefeller Center for their Ground Up contest, and I won! 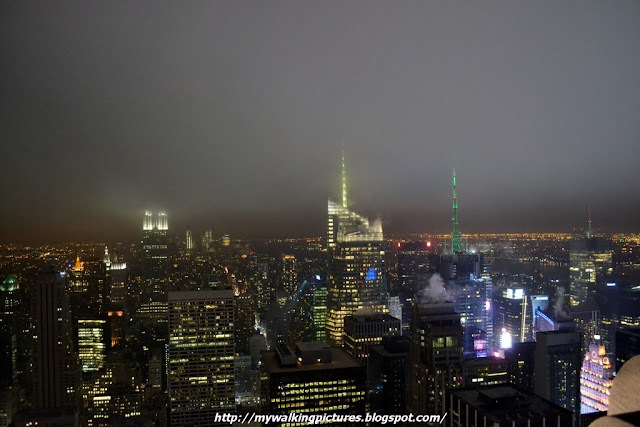 My prize was two tickets to its Observation Deck at the Top of the Rock. 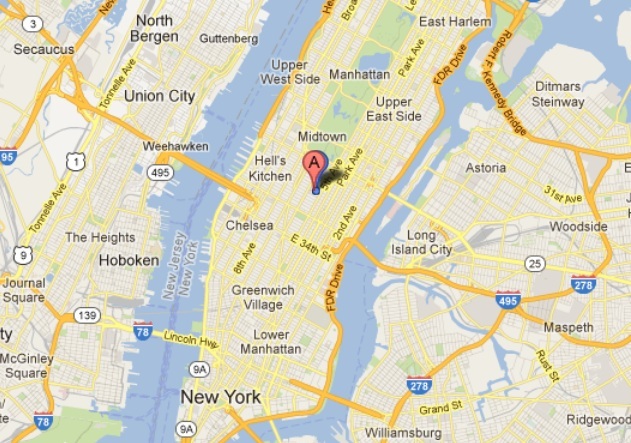 I immediately used one of the tickets and enjoyed the 360 degrees view of New York City. I was thinking of using the other ticket last autumn but wasn't able to use it until last week, just a couple of days before the ticket expired. At that time, the staff were saying visibility is not good because of the fog but I had no choice otherwise the ticket will expire. 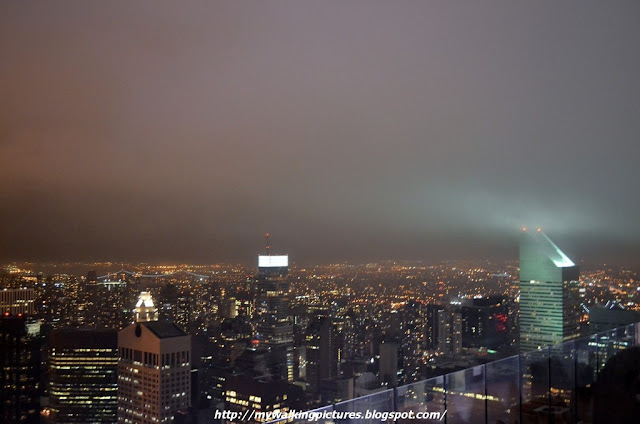 New York at night is beautiful with all the lights, and the fog, I think, added to the beauty. 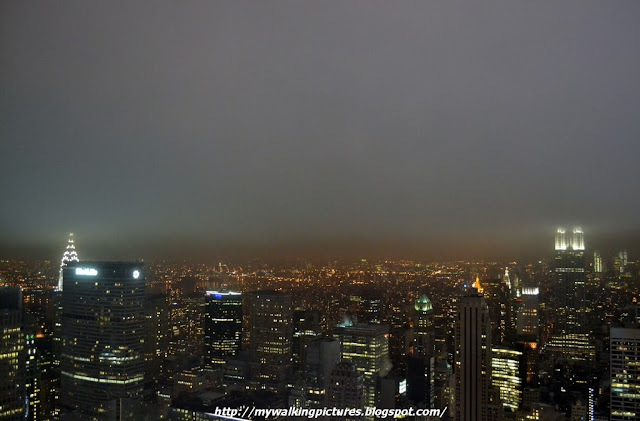 That was my view that night looking at midtown and lower Manhattan. 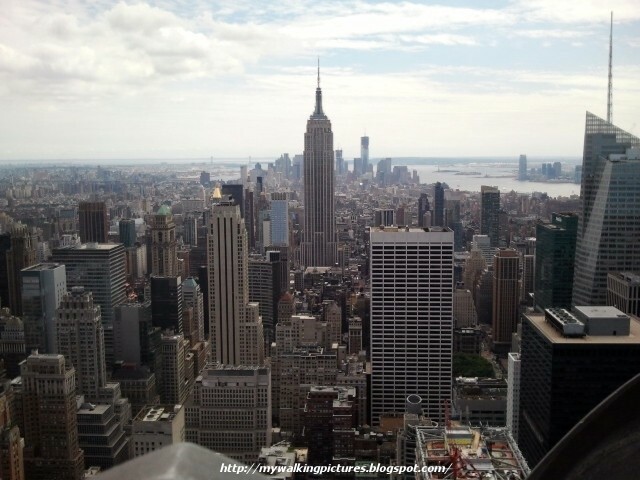 Last summer, standing at almost the same spot, I was enjoying this view. 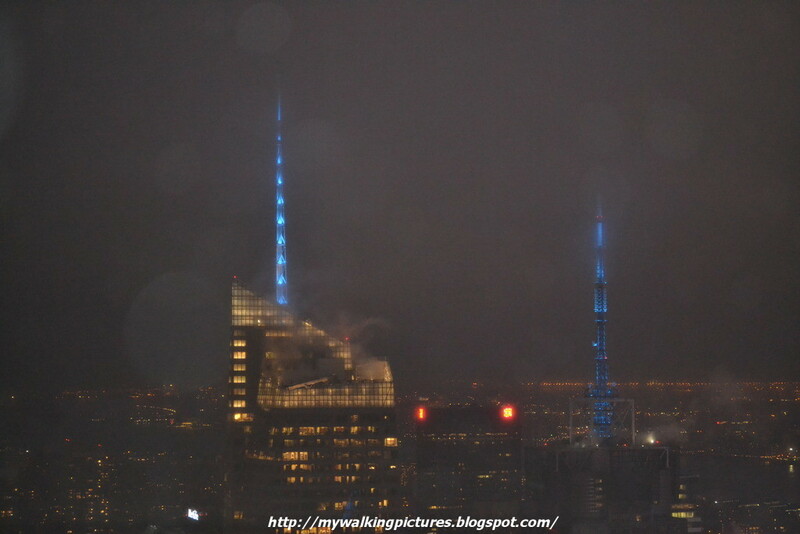 There were times the fog was so dense, the lights of the Empire State Building could not be seen. 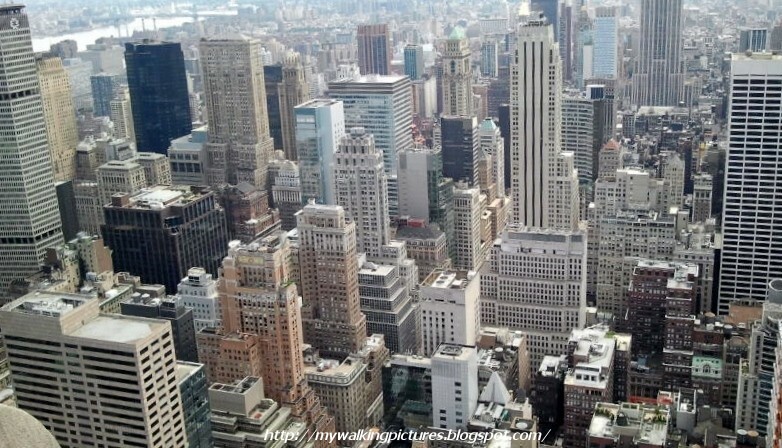 At the other side of this view is Central Park and upper Manhattan. 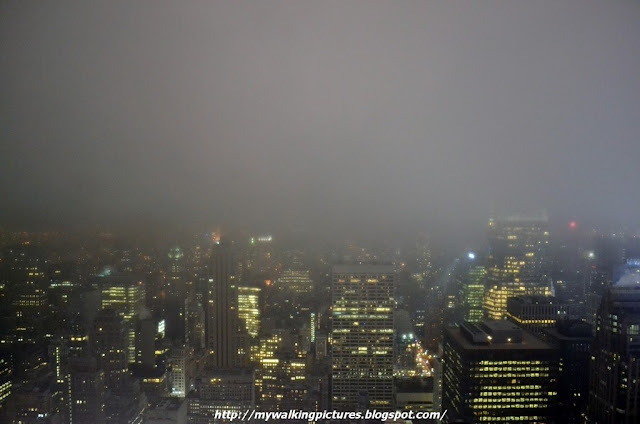 As it was late afternoon and foggy when I was up at the Top of the Rock, I couldn't see much of Central Park except for the lights from the lamp posts around the park. 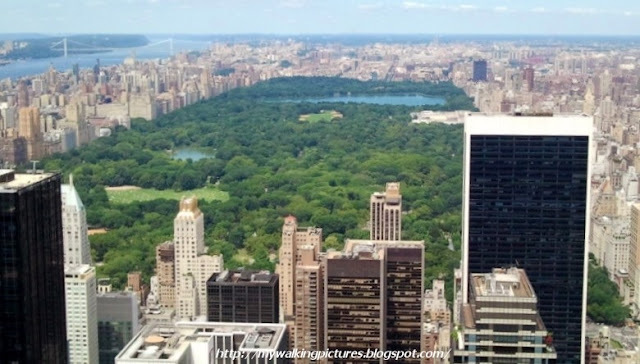 A very different view from the one I took last summer, Central Park looks gorgeous in daytime! 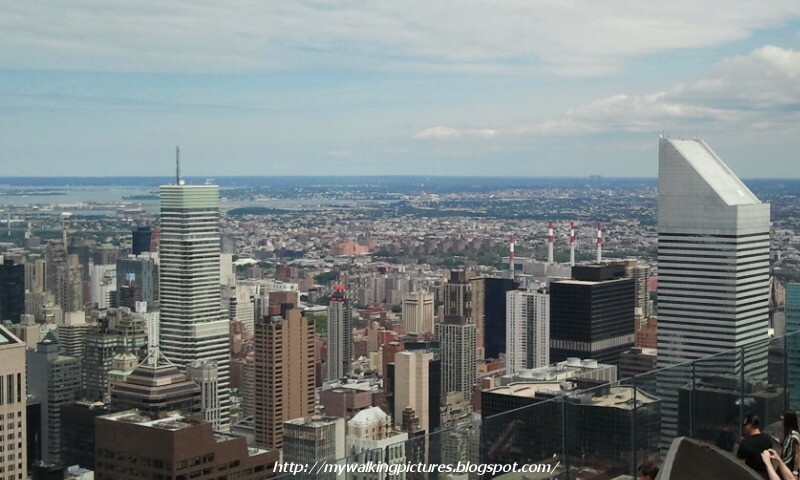 Looking east, you can see the views from the lower avenues of Manhattan and the borough of Queens. 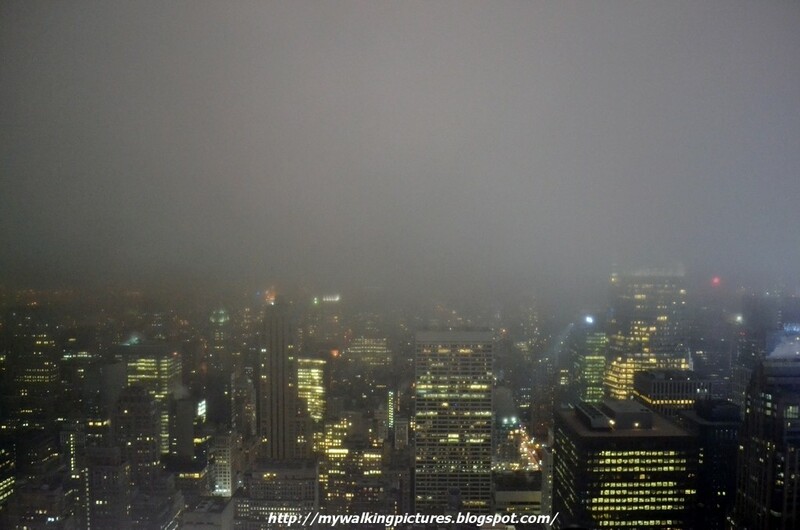 When I was at the Top of the Rock that foggy night, there was this dense fog rolling over the area. 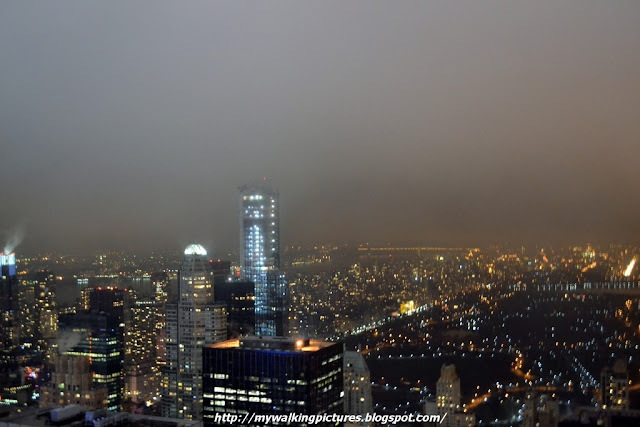 I know the Citicorp Building, the tallest in Queens is there in the above pic, maybe just obscured by the fog cause on a clear day, it's the one thing that stands out when you gaze across the East River to Queens. 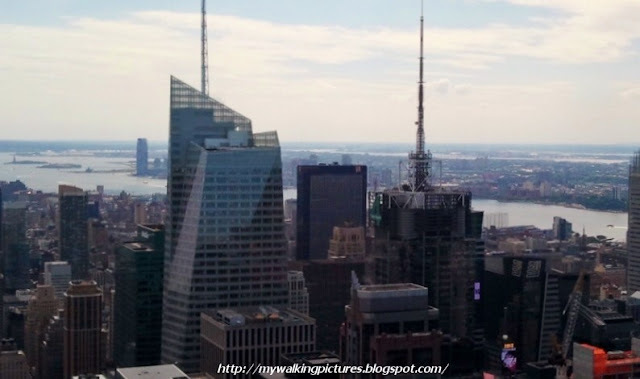 During daytime you can see the river, just like the people up on Top of the Rock saw Captain Sully make that miracle landing on the Hudson River four years ago. At the northwest side of Manhattan, you could see the Upper West Side and parts of New Jersey. During daytime, you could see the George Washington Bridge which connects Washington Heights in northern Manhattan to Bergen County in New Jersey. 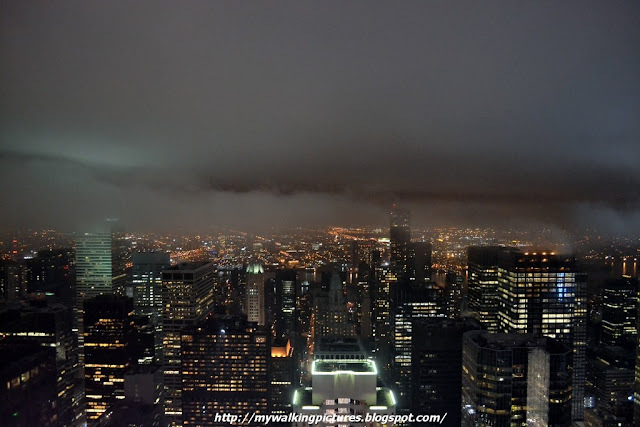 At night, the lights from these two tall buildings at the southwest part of Manhattan catches the eye, and, on a foggy night, the lights still shine through. The tall building on the left is the Bank of America Tower, I don't know the other building, though. Here's how they look during daytime. The tall building at the back is Goldman Sachs Tower, the tallest building in New Jersey. And if you just squint your eyes a little bit, you could almost see Lady Liberty at the far left of the above pic. 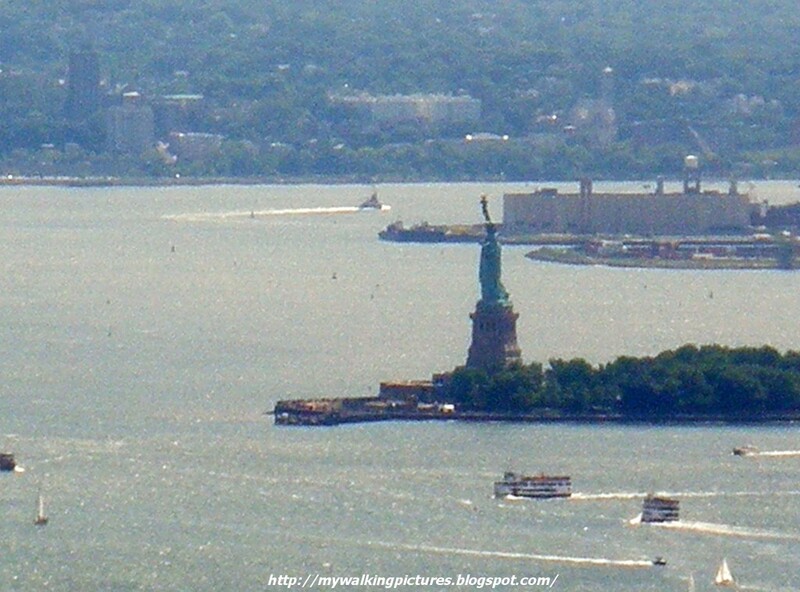 Here she is, as seen from Top of the Rock on a summer day. 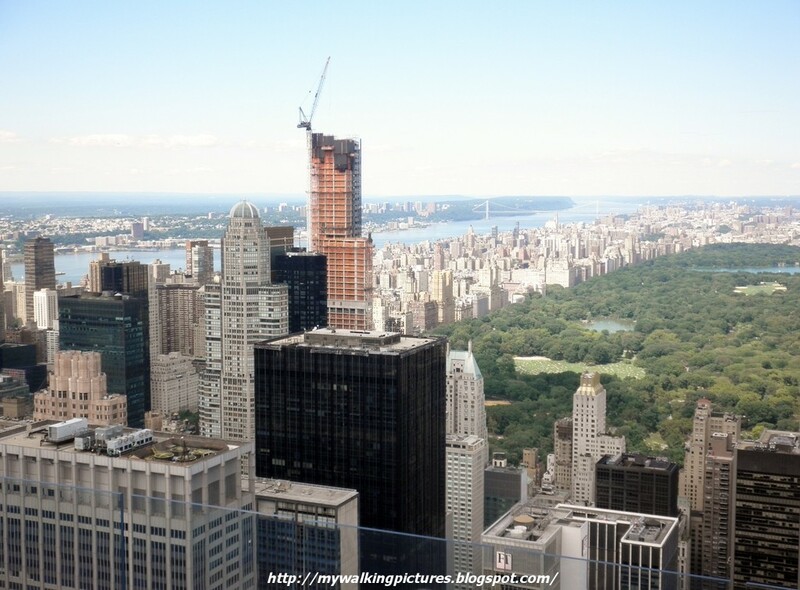 This is the view on the northeast side of the Top of the Rock. The lights in this pic belong to the buildings on the Upper East Side of Manhattan and the borough of Queens across the East River. 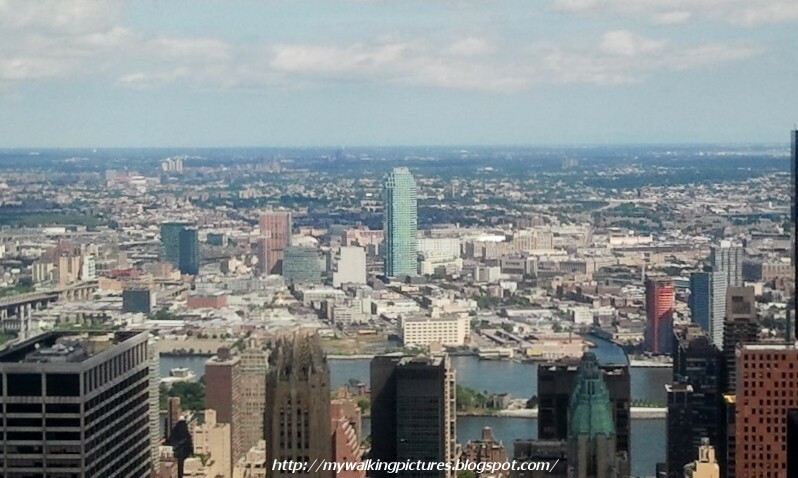 In the daytime, you can clearly see Queens stretched out across the East River. Big Allis is right there, its smoke stacks shining brightly in white and red. On the southeast side, the Chrysler Building plays hide and seek behind the Metlife Tower. 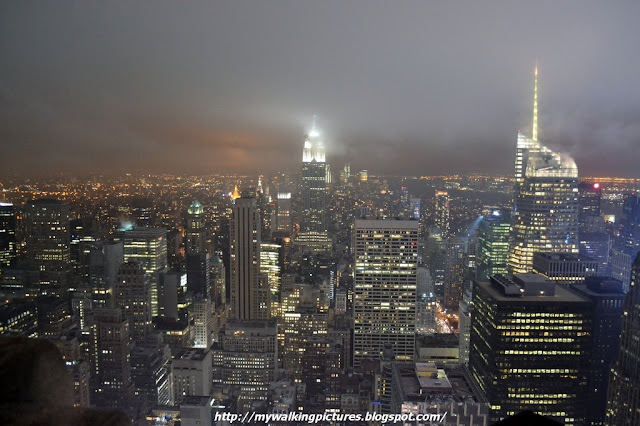 In between the Chrysler Building and the Empire State Building in the pic above is the Lower East Side of Manhattan and Brooklyn across the East River. 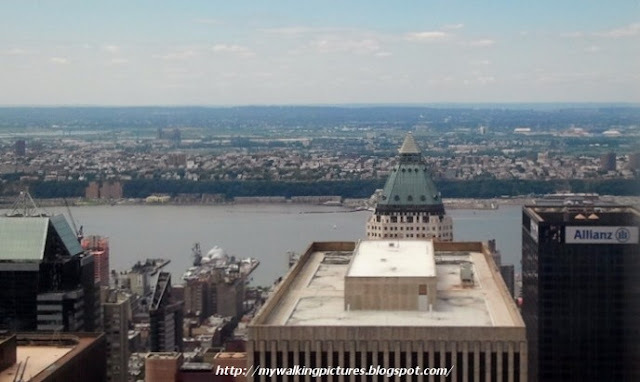 During daytime, you could see the three bridges connecting Brooklyn to Manhattan - Brooklyn, Manhattan and Williamsburg Bridges, often referred to as BMW. That covers the views seen from Top of the Rock. 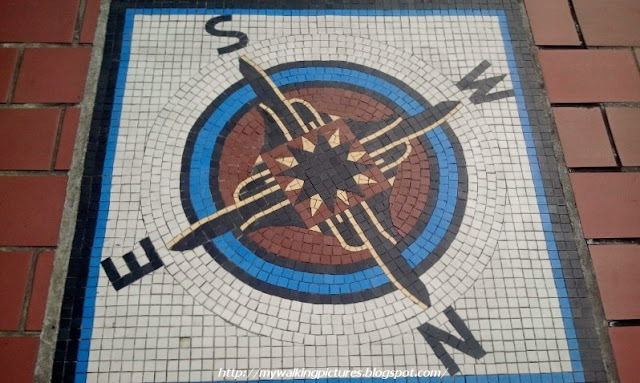 If you get a little disoriented, embedded on the floor of the Observation Deck is a directional map of sorts. 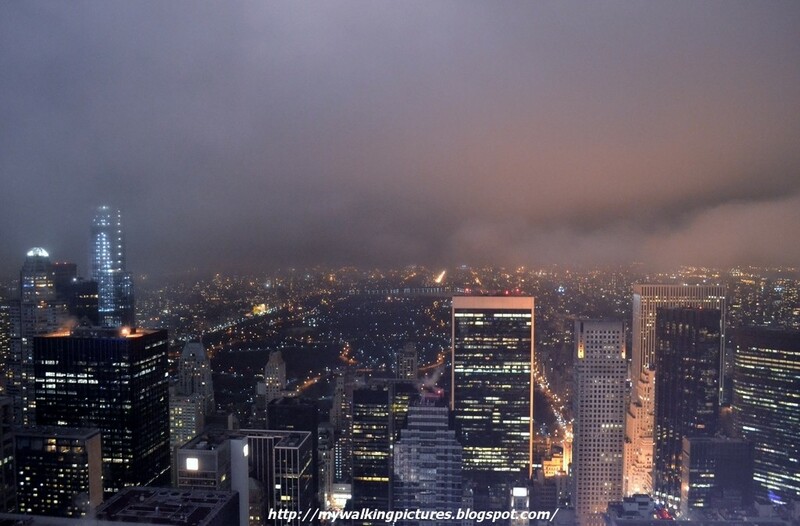 I like the night view since you can see the lights in the city that never sleeps. At the lower right corner of the pic below is a bright well-lit area. That's Times Square, the area is bright with all the neon lights. I like the daytime view because you can see the individual buildings that make up New York City, the different designs and structures, as well as the rooftops, some with solar panels. An added bonus in the daytime is you can see St. Patrick's Cathedral through the gap in the decorative designs adorning the top of the Observation Deck. 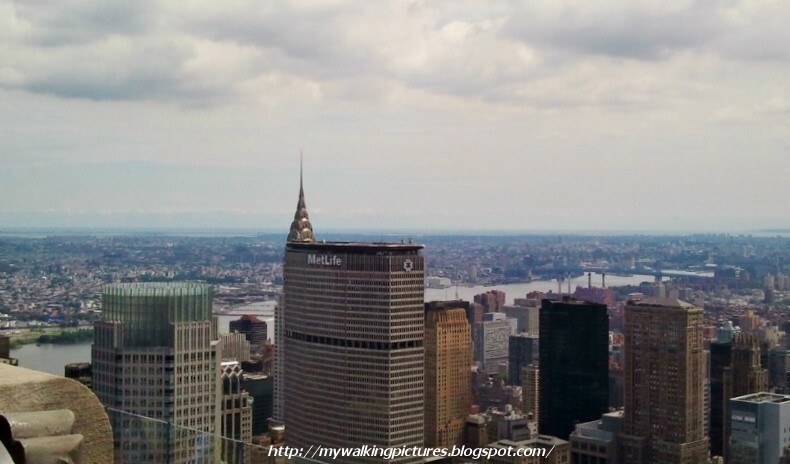 As you can see from the map, Rockefeller Center is right there near the center of Manhattan and being up in the Observation Deck gives you a 360 degree view of New York City and parts of New Jersey. In summer or winter, in daytime or at night, in bright sunlight or fog .. New York, you're so captivating! 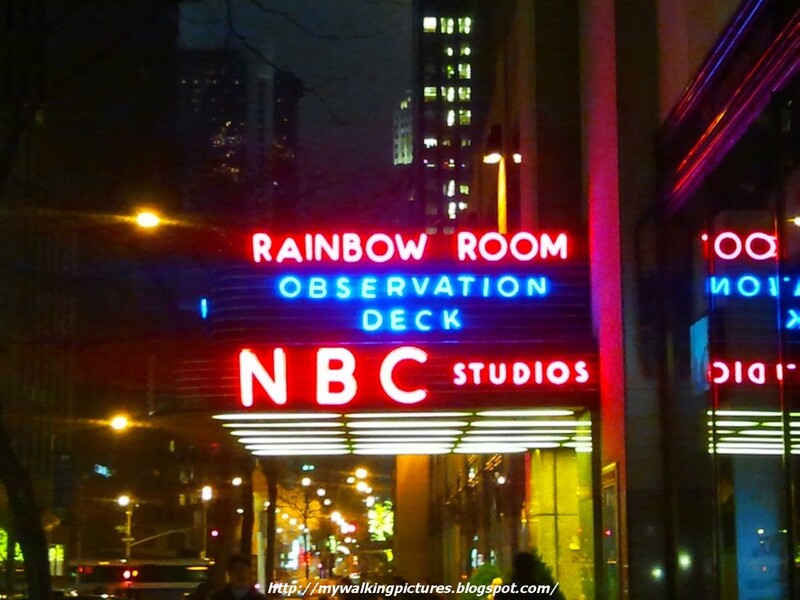 Thank you Rockefeller Center for the free tickets, the views from your Observation Deck are awesome! 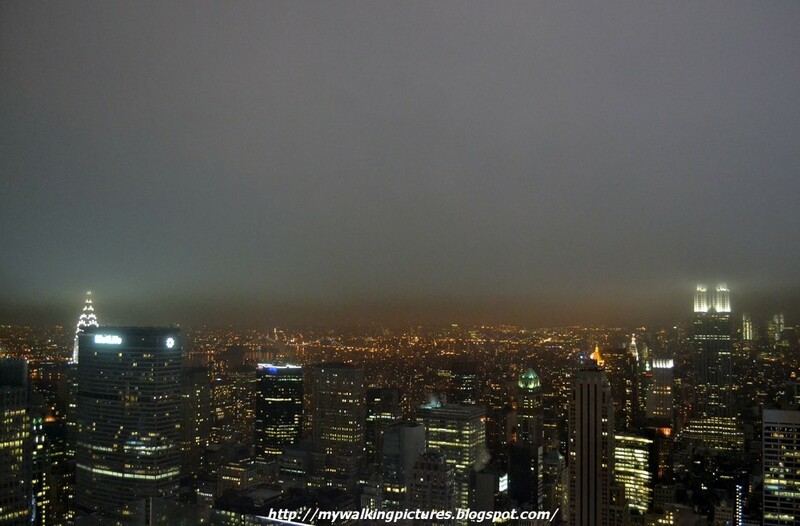 That was a great experience, seeing the city in different seasons, in daytime and at night with all its lights. I'm hoping to be up there again, maybe in the spring or autumn. 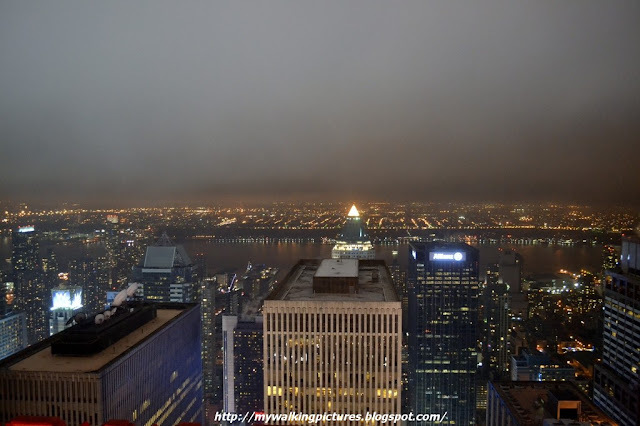 Yes, way up there, at the Top of the Rock!